Two or three years ago, I made this recipe as the original instructions indicated—using cheddar and parmesan cheese. Neither Mahon nor I were especially blown away by them, and I never made it again. Last summer, we went for the first time to Tucano's, a local restaurant chain that serves Brazilian churrascuro (grilled meats & veggies) and fell in love with their pao de queijo. In trying to figure out why we'd loved the Tucano's rolls so much more than the ones I'd made a few years before, I did a bunch of research and found that most of the recipes online call for only parmesan, rather than parmesan and cheddar. 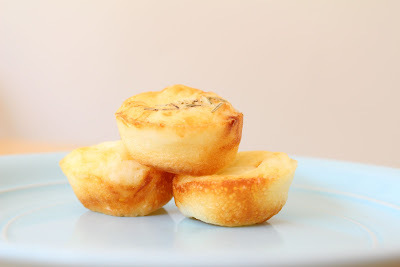 Although I was skeptical that parmesan could be the cheese in the Tucano's rolls, which are very mild-tasting, we decided to give it a try and adapted the recipe from Our Best Bites to use only parmesan. To our surprise and TOTAL delight, we had hit on exactly the right cheese! Our rolls were even better than the ones at Tucano's, since we ate them straight out of the oven and they were incredibly fresh and light. I'm embarrassed to say that between the two of us, we downed the whole batch in one night! 1 cup tapioca flour (also called tapioca starch)—don't substitute this! Every recipe I read agreed that the tapioca flour is what makes these rolls unique and authentic. Bake 15-20 minutes or until the rolls have puffed up (they will puff quite a bit!) and are just barely golden on top. Ours took exactly 15 minutes. According to the original recipe, the yield varies depending on how full you fill your muffin cups; we ended up with about 20. Serve immediately. These made a great companion to a meal of Black Bean Soup (also a Brazilian recipe originally from OBB! ).